The launch began with AR Rahman performing the song ‘Mazhai Kuruvi' from the album. The audio from Mani Ratnam’s Chekka Chivantha Vaanam was launched on Wednesday in Chennai with AR Rahman performing live. The film marks their 14th collaboration. 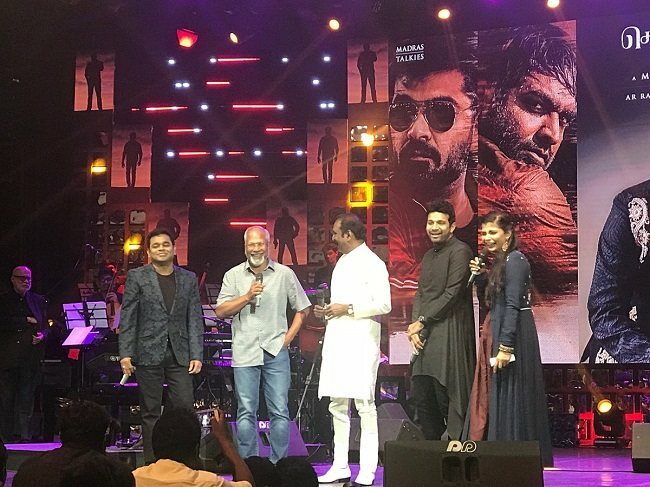 Titled 'CVV Live', the event saw the likes of poet and lyricist Vairamuthu, actors Arvind Swamy, Arun Vijay, Silambarasan, Aishwarya Rajesh, Diana Erappa and Aditi Rao Hydari in attendance. Hosted by singers Chinmayi and Karthik, the launch began with AR Rahman performing the song ‘Mazhai Kuruvi' from the album. Accompanied by the transcendental percussion by Drums Sivamani, the song’s lyrics we learnt were taken from Vairamuthu’s poem. Speaking at the event, AR Rahman shared that Mani Ratnam has been working with the same energy that he had from back when he started. “He has gone back to his Nayagan days," he said to thunderous applause. He also shared that he has done 8 films with Mani Ratnam, and wondered out loud why wasn’t he in the others. “People usually miss out these two. I’ve done two songs in Iruvar and I’ve dubbed for Shah Rukh Khan in Uyire. So that makes 8,” he said. Actor Arun Vijay who plays Thyagu shared that it was a dream come true for him to have been a part of the film. “My debut film, when I was in standard 12 was supposed to have music by AR Rahman. Unfortunately, that did now work out. I’m very glad it did for my 25th film. I’m very excited,” he said, to loud cheering. Actor Silambarasan, who is collaborating with Mani Ratnam for the first time, said he has nothing more to say other than thank you. He also added that while he’s known for his speaking skills, he’d rather let his film speak this time and quickly exited the stage. Actor Aishwarya Rajesh, too, said it was a dream come true for her to have been a part of the film and said that she found it refreshing to have had a nice makeover for her character in this film. She also added that her she plays a Sri Lankan Tamil woman in the film. Lyricist Vairamuthu was all praises for Mani Ratnam and added that he was the main driving force behind the team. When asked the three - Mani Ratnam, AR Rahman and Vairamuthu - what was their favourite number among all the ones they’ve done together, Vairamuthu and AR Rahman picked songs from Bombay, 'Uyire' and 'Kannalane' respectively, and Mani Ratnam shared that it was 'Tamizha Tamizha' from Roja. Singer Sunitha Sarathy performed 'Sivanthu Pochu Nenje' and Shakthisree Gopalan performed 'Bhoomi Bhoomi' from the album. The film will release on September 28.